The Missing Key to Military-Civilian Transition. Join thousands of Service Members, Veterans, and Military Spouses in setting up free 1-hr mentorship phone calls with successful professionals. We’re the only Veteran Mentorship Platform to let you choose your own mentors and as many as you would like; our average member selects 4 mentors, and some mentees have 25+ mentors! 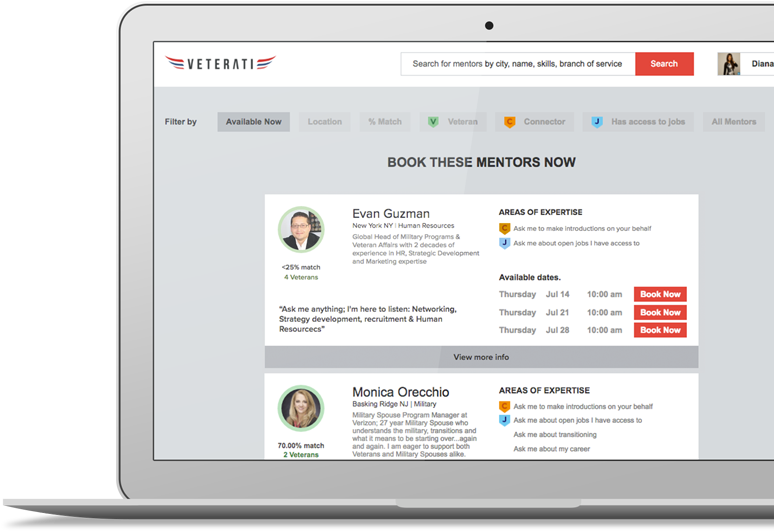 Create a free profile at Veterati to get unlimited access to thousands of volunteer mentors: CEOs, recruiters, entrepreneurs, managers, Veterans & civilians alike. Maria provided me numerous recommendations that were extremely helpful. She is very knowledgeable about the logistics field, particularly with supply chain management. Immediately after our conversation, I started implemented her recommendations. I plan on seeking her mentorship and guidance repeatedly. Jon was honest and direct, which I appreciated. I enjoyed listening to his experience regarding his transition and as a leader in the business realm. He provided sound advice regarding my options for a master’s degree and provided insider knowledge to what companies value in an employee. After my conversation with Jon, I have a better idea of which direction I should go as I continue on with my transition from the military. Thank you, Jon. Sahm is extremely knowledgeable and willing to help veterans in any way he can. Our conversation focused on opportunities in investment banking. His industry expertise allowed him to provide me with excellent, actionable guidance on networking and interview preparation. I look forward to working closely with Sahm as I transition out of the Army. Stephanie was great. She provided additional information on the hiring process that two previous mentors didn’t have. Additionally, despite my future need for services she provides, Stephanie provided information on a competitor who may be more beneficial in my company’s core market. Selflessness like that is hard to come by. Alicia possesses great interpersonal skills and would be an asset to anyone looking for a great mentor. She understands the current and trending job market in the oil/gas and manufacturing businesses. She provided superior insight on how to get my resume noticed and what companies to keep an eye on. I would recommend Alicia to anyone looking for a knowledgeable mentor that is truly diligent to getting veterans into lasting employment. Kearstin shared crucial tips about resume writing and introduced me to new ways of highlighting my work experience. She offered personal advice about career transitioning as a military spouse. I left the conversation with actionable steps to improve my resume, a new job opportunity to explore, and advice on the transitioning to a new career field while on the move. Mr. Silver is a tremendous source of knowledge and inspiration who put in dedicated hours above and beyond what is represented here to ensure I was in the most optimal position possible for future employment. He sincerely cares about helping veterans build the most impressive case for themselves as possible during both the application and interview process with unrivaled firsthand knowledge from one of the most prestigious companies in the world. Trust me when I say you want Mr. Silver on your team! Justin is ahead of the game looking to develop relationships and networks to work on his candidacy for opportunities in finance before he begins an MBA program in the fall. I look forward to helping and working with Justin as he moves through his transition out of the military. I had my first mentoring session today and I don’t think I’ll ever be the same person. I teach negotiating skills and a member of the Army who will soon retire called for advice on an offer she just received. Though I am a veteran, I went to law school after separating from the Air Force, I had never thought about the fact that they have never had to think about salary negotiations and it’s inherit anxieties. The call started with her expressing her apprehension and ended with her full of confidence and a plan. When I got off the phone I cried…tears of gratitude…for her service and for finding a way for me to give back in a meaningful way. Thank you for this opportunity. You are changing lives on both sides of the call. Mike is passionate about helping others reach their full potential, and I’m sure the people he manages can feel that success when working with him. Mike is highly intelligent, and enthusiastic in whatever he chooses to do. I look forward to continuing our relationship and helping him explore next steps as he is transitioning. Completed my first mentoring call today. What a rush! I’ve been working with vets in other capacities and the ease of access through this platform is amazing! I see nothing but great things for the future of this tool through the investment of both the mentors and mentees. Jacob and I had spoken about many things in our first meeting. but we scheduled this call to review changes to his resume to have it more focused for the private sector. Shorter bullet points, more measurable info, and reduce to one page overall. We reviewed the new resume and discussed strategies on how to bring the ideas on the resume to life in an interview and leverage the work he had built into the longer form resume. Jimmy is incredibly humble when it comes to talking about his nearly 40 years of accomplishments. With more than 22 years in the Navy, Jimmy impacted the lives of many through his stellar leadership and dedication to service. Jimmy would be a high value asset to any organization. Evan Guzman, Former Global Head of Military Programs & Recruiting, Verizon. Meanwhile, 80% of job opportunities are accessible only through personal networks. Veterati is an innovative mentorship platform that makes being a mentor and finding mentors effortless. Connecting job-seekers to mentors at scale is phase 1 of Veterati’s greater mission: to transform job search from a painful experience into an inspiring journey. Former Marine Daniel Rau messages entrepreneur Diana Tsai via Linkedin. They talk about the career challenges faced by service members coming home. They launch a 2-week project to work together via Skype calls to mentor 6 of their friends and former Marines into meaningful careers. In the process, they learn that transitioning is not just a challenge for their friends, but also for 1.5 million veterans coming home after 9/11. Daniel & Diana realize they need backup to solve such a massive challenge. 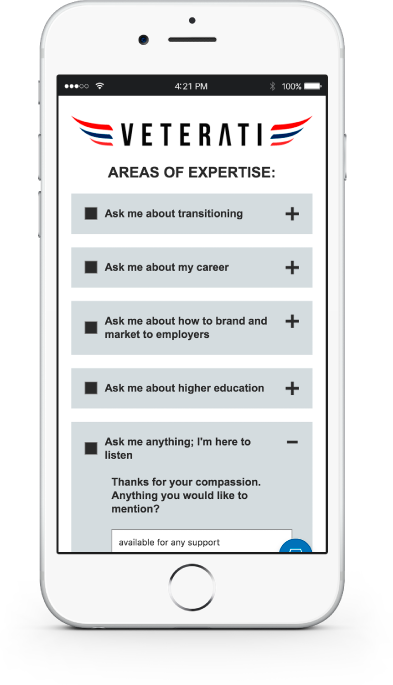 With a team of friends and trusted advisors, they begin exploring the core problems of the transition process, seeking causal reasons for why many Veterans face challenges in finding jobs after leaving the military. They speak with thought leaders in recruiting, workforce development, and even match-making. They listen to Veteran Service Organizations and the stories of hundreds of transitioning Veterans. They realize the big problem is in the job market: more than 80% of job opportunities are never published, and exist within personal networks. The team begins to envision a solution: a platform that effortlessly creates mentorship conversations between Veterans and successful professionals. While catching-up with successful tech entrepreneur and long-time friend Thy Tang, Diana & Daniel mention the platform they’ve resolved on building. Thy says, “You guys forgot: I was a Marine. I’ve always wanted an opportunity to help my brothers and sisters.” Thy joins as CTO and brings in his team of engineers, and product build begins! 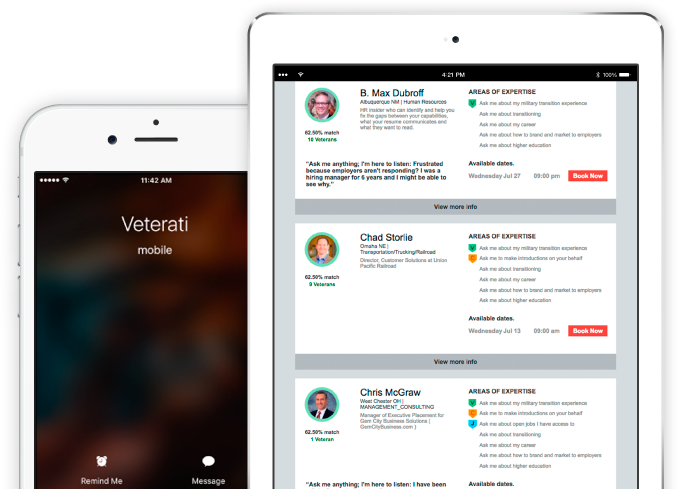 After launching a successful pilot program in November 2015, Veterati opens the platform to Service Members, Veterans, Military Spouses, and Mentors across the country. 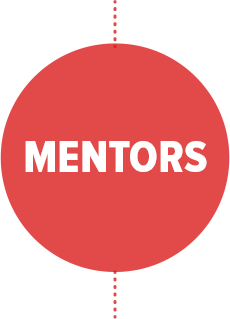 Since opening, mentees have been averaging 3.7 mentor calls per active user. 98% of mentors report they want to mentor again. 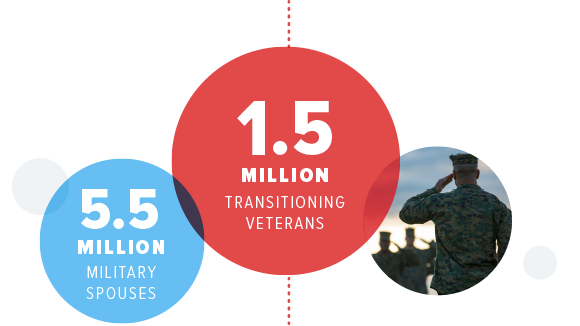 Compared with competitors charging job applicants for career coaching and guidance, Veterati has provided millions of dollars worth of free mentorship for 10k+ members and is partnered with the nation’s leading Veteran Service Organizations and Military Employers to deliver free, on-demand mentoring to our entire military community. An exclusive, behind the scenes story of Veterati cofounder,Diana Rau told by her friends and family! Veterati cofounder Diana Rau awarded Forbes 30 Under 30 Social Impact Entrepreneur for 2018. Veterati is a for-profit digital platform that helps transitioning veterans find mentors among successful professionals. When he realised finance was not for him, Rau called a buddy and got a job ‘in two weeks’ doing close protection work..
Want to know what mentees and mentors are saying about their Veterati experience? The Transition Center is originated and operated by volunteer Veterati Mentees & Mentors, with development & design sponsored by Veterati. Together, we’re building a knowledge community for all of us to share collective wisdom.